SFWGossip: Who is Joining "American Idol"? Ellen DeGeneres!! !Safe For Work Gossip (SFWGossip)! Safe for work news, safe for work pictures, yet 100 percent entertaining! Who is Joining "American Idol"? Ellen DeGeneres!!! It was just announced that comedian and talk show host Ellen DeGeneres will be replacing Paula Abdul at the judges' table on the upcoming ninth season of American Idol. Finally! With the new season just around the corner, everyone was getting antsy wondering who would join Randy Jackson and Simon Cowell on the hit American TV show. "I'm thrilled to be the new judge on American Idol," the Daytime Emmy-winning talk show host said in a statement. "I've watched since the beginning, and I've always been a huge fan. So getting this job is a dream come true, and think of all the money I'll save from not having to text in my vote." 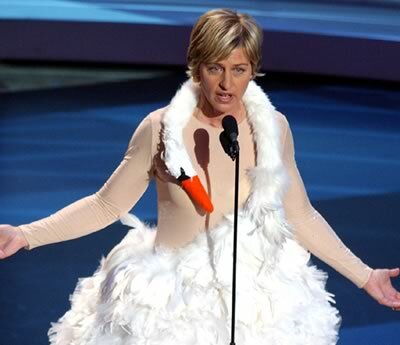 DeGeneres has signed on for the entire season, so we are excited to see what she can bring to the table!